When we talk about research we often think about the academic world and specialist organisations with elite expertise. This image of research can seem quite removed from everyday life. At times, we might find it hard to see the relevance of academic studies to the realities of community life, with the challenges it brings. Yet research is an essential tool that allows us to understand what works and what doesn’t work in our neighbourhoods. It can help to challenge assumptions and reveal patterns and underlying causes that are not obvious at first sight. Research can also produce evidence of a need or demonstrate impact of a potential solution, and this can help us to start addressing issues. PAR (Participatory Action Research) is an approach to research in communities that emphasises participation and action. It is based around collective inquiry and involves communities directly as researchers. Science shops can connect communities and civil society with their local university. A community might have a question or issue that they feel needs researching, but they might need support in framing the question and/or carrying out the research. When approached by community groups with a research issue, universities match them with Masters or PhD students, who write their own thesis (supervised by an established academic) around the questions put forward by the community. So in community research, people set the agenda of the research and are actively involved as researchers, not simply subjects of the research. This ensures the outputs and findings of the study really have a lasting impact on the community. Community research can also be very empowering for the people involved, who can learn a number of important skills. 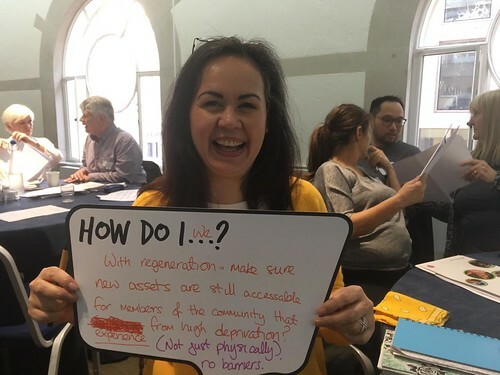 At present, several Big Local areas are setting up community research teams to explore issues of interest to their neighbourhood, based on the priorities identified in their Big Local plans. Recently we came across two really good examples. In Whitley Big Local (South Reading), over 12 students and residents received training in PAR methods by experts at the University of Reading. They carried out research on Whitley transport needs, with the aim of tackling deprivation and social exclusion by making people ‘more mobile and connected’. The community research team surveyed 500 local people on their experience of travelling around town. They also conducted 30 interviews with the public and with voluntary sector organisations and arranged five community focus groups to gain thorough understanding of the issues. The final report - Working better with Whitley: exploring the everyday transport needs and experiences of local communities in South Reading - highlights the biggest barriers to ‘getting around’ identified by residents. The report includes recommendations on how to improve access to transport and these are currently under discussion with the local council and ReadiBus, Reading’s bus service. The experience of community research in Whitley has been so successful that a new project is about to start, this time focusing on financial exclusion. Another great example of Big Local’s community research is the project SharedVision: community-student-staff research partnership for public engagement with underused open spaces. In this case, SO18 Big Local, Training for Work in Communities, Southampton City Council and the University of Southampton are working together to improve the use of three underused green spaces by the local community. The research aims to provide evidence for future work by SO18 Big Local by gaining better understanding of local residents’ views on the green spaces. Two MSc Environmental Sciences students undertook their research dissertations with the Shared Vision project, supporting the community-led research. Local residents participated in surveys and focus groups. The research team also ran Nature Hunts around two of the green spaces (Frogs Copse and Harefield Woods) in June and October this year, with up to 80 people attending. Families followed trails around the spaces, learning facts about the flora and fauna (pictured below). SO18 is now hoping to involve interested local people that might in time establish a ‘friends of’ group to help improve the management of these greens spaces. How can community research help Big Local areas? develop evaluation skills that can be applied to plan reviews and help areas keep track of their progress and impact. Do you have any examples of community research in your area, its challenges and opportunities? We'd be pleased to add links to your community research projects underneath this blog. Do get in touch and share your experience: sonia.bussu@localtrust.knightstudiosdevelopment.com.